Garage doors are a very important part of the house, they almost take the spotlight for their size and play a very important role in the overall design, you cannot fall into the error of implementing a style in your home and finish it just before arriving at the garage, our garage should beautify our façade and continue the decoration set because given its size it is very visible and its design can complement or completely ruin the decoration of our house. There are different materials for the doors of our garage and technology has been responsible for making it easier to operate, this book of ideas will take you through a tour of 10 garage doors with different styles and operation to inspire you and give you the proper background knowledge you’ll need to achieve your goals in terms of selection. Technology advances and keeps pushing boundaries for all of us, making things that seemed completely impossible happen on a daily basis and stop looking so impressive. Automatic gates are a great example of this. As for garages, the most used doors are metal due to their resistance, it is excellent for those designs with the doors black in colour that contrasts perfectly with all the decoration and at the same time conceals the deterioration that weathering involves in this type of doors. A sliding door is excellent for a garage because it does not interfere in the internal or external space, you will not have drawbacks of scratches on your car through the opening of the door or an accident on the outside for the same reason, this door is made of an elegant and resistant wood, an excellent choice for a facade of a garage door gives the feeling that this space was anything other than a garage because of how well it looks. These types of garage show us that the mixture of different materials can be an interesting combination, both the floor and walls and ceilings are carefully selected and maintained. Here the door is automatic rolling so your car will also be protected from both theft and scratches by the automatic technology it handles. If we talk about garage doors, the internal door also counts and if we want to go further in design issues we must break many paradigms among many that a garage is the place where we keep the car, tools and old things that we do not want to have for all parts of the house, because a garage can become a place full of design, with this type of garage the door that matters is the internal one because it shares an environment with a small room, there is no need to hide the car or the garage because they are worthy of showing, for this, the door is made of glass achieving a complete atmosphere with a sophisticated touch. Here not only the door but the entire garage was made to measure the car, with stainless steel and an automatic door that lets you see what kind of car is stored there. This house shows us an imposing industrial garage, spacious, full of light and its doors of the same style, automatic folding doors or not, go well in a very large garage where the space they occupy when opened is not occupied by cars but that is free allowing its closure and opening. These doors are not automatic but they are a good combination both for their material and their operation, if the garage is located inside your house a glass door works perfectly because it will make your garage and your car look like new, in terms of its operation, a folding door is very easy to handle so it is not automatic, you just have to be very aware of the location of the car so as not to interfere with the opening of the door. In this house nothing is left to chance, the doors of the garage far from being forgotten not only complement all the decoration but call attention to their design, these doors are automatic folding type very easy to use. When you decide to add some design or colour to your garage doors keep in mind that you should also be aware of the maintenance of paints and lacquers. 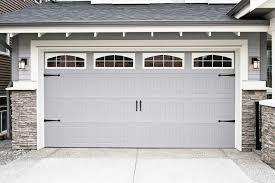 While the heat of the cars is concentrated in the garage, in hot climates that may seem like hell, so you should not use the same type of door used in cold climates, but a design that allows air to circulate through all the space both for releasing heat and for cooling properly and at the same time the door of your garage can impress the whole neighbourhood. The range of greys coming to blacks are the recommended colours for garage doors for protection but also the material of the doors is very important to avoid deterioration in them, so the recommended material is stainless steel that will be maintained intact despite being exposed to sun and rain. If you are looking for a proper place to acquire advanced solutions such as automatic swing gates, automatic sliding gates, door openers or sliding gate motors here at MDI you will be able to find top quality equipment that provides you with security and the comfort of opening and closing gates and doors by clicking only one button. One of the leading providers of Australian-made technologically advanced solutions that ensure all your needs will be satisfied.